However Improbable: "If I was a bathroom, where would I be?" "If I was a bathroom, where would I be?" Today, as part of my Blog Book Party being held in honour of my book being published, you all will have the chance to meet a very dear friend of mine. Melody! And you will get the chance to learn of her wonderful book! First off, I would like to say a big thank you to Jack for hosting this party and allowing me to be a part of it! I have always been someone who wanted to know what happens after a story. With few exceptions, even when stories end happily and seem to tie everything up, there is a small part of me that wants to know, what then? And when stories don't end happily, when there are a million loose ends that are left; I go crazy wanting to know, WHAT HAPPENED NEXT!!!! That is the question that drove me to write my Three Kyngdoms series. I was about seven or eight when I first became interested in Arthurian Legend. My first exposure to it was probably reading some of the tales in an encyclopedia. ( I read encyclopedias like they are novels. It's amazing what you can learn from those wonderful volumes!) As I grew older, Arthurian Legend became one of my favorite things to research. It astounded me at first how many versions of the legend there are. 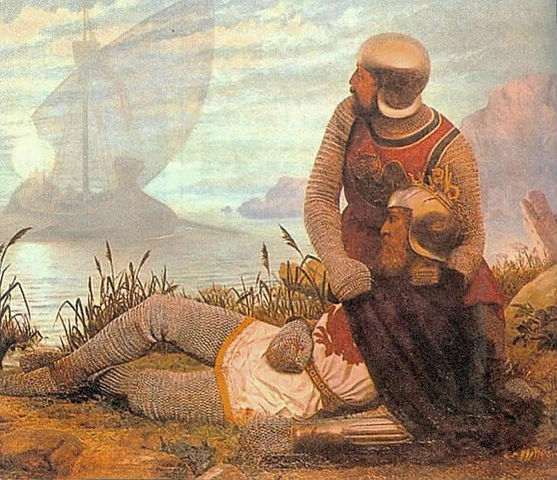 Besides all the historical versions (The Mabinogion, Tennyson's Idylls of the King, Malory's Morte D'Arthur), many people in our day and age have written their own versions of the legend. Some are a lot of fun (BBC's Merlin for example) and others I stay away from (Mists of Avalon). As I began writing more and more, I knew I wanted to write about Arthurian Legend someday, but I didn't want to write just another version of the legends we already know. Through the years a question kept haunting me. What happened after the Battle of Camlann? Most sources agree that Arthur and Mordred died on each other's blades, very few of the knights survived the battle, Guenevere and Lancelot retired to abbeys, Excalibur was returned to the Lady of the Lake and Arthur was taken to Avalon. But then what? What happened to Camelot, to the Round Table? King Mark of Cornwall; what happened to him and Cornwall after Tristan and Isolde died? Also, the part of the legend that says Arthur will rise again in Britain's greatest hour of need would not leave me alone. Finally, I knew that was what I had to write. The story of what happened after. The first book, tentatively titled For This Time, begins several hundred years after the Battle of Camlann. Darkness fell on the land following the battle, ending the Golden Age of the three kingdoms– Camelot, Cambria and Cornoval– and beginning the Dark Age. A succession of Mordred's descendents attempted to rule Camelot but all were weak and could not unite the torn land. Chivalry and the traditions of knighthood have now almost died out, but are kept alive by some old knights, who in turn learned from their fathers. There are almost a dozen elven kingdoms whose inhabitants are reclusive, for the most part. 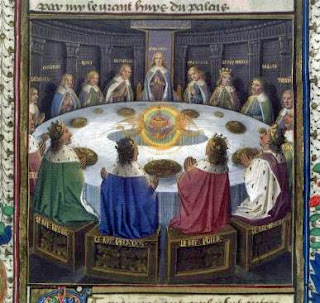 The largest and most important of these is the Grail Kingdom of Lystenois, ruled by the Grail King and High King of all the elves, from his castle of Corbenic. The other main elven kingdom is Drych Llyn, the realm of the Lady of the Lake, High Queen of all the elves. The bards, sages, prophets and healers continue to train apprentices in secret. People keep to themselves and rarely trust anyone outside their own villages. Tales of the Golden Age have become legend, stories told in front of the fireplace late at night. Told most of all is the legend that Arthur will rise again and take back Camelot, returning it to peace and prosperity. Slowly, the series began to take shape in my mind and other pieces were added in. The Song of Roland, Spenser's Faerie Queene, Greek and Norse Mythology all furnished inspiration for this story. Then a few fun things added themselves, like lions to guard the gates of the castles. And unicorns for the elves to ride. The majority of the characters in the story are descendents of not just the kings of the three kingdoms, but the knights that fought alongside them. What I had to find out was, what was different about the descendents? Which of their ancestor's mistakes will they learn from? Which ones will they repeat? Eventually, as I read more of the legends, they all began to speak to me and tell me their stories. Kay, Arthur's foster brother, what if his descendent had a twin sister? Mordred. I know he lusted for power but what else drove him? What drives his heir? Morgan le Fay was a fascinating, sometimes good, sometimes bad character in the legends. What side does her descendent come down on? Does Exaclibur still exist? If so, can it still prove the true heir? Along the way, as I dug through the various versions of the legends, I did find myself essentially writing my own version of the legends, by picking and choosing which parts I would use and which parts I would disregard. I do have several snippets posted on my blog, for anyone who would like to sample the story. Feedback is always welcome! For now, I'm simply trying to enjoy the journey as much as possible. Thank you for your time and happy writing to all of you! Miss Melody Muffin blogs over at The Splendor Falls on Castle Walls. She has many interests which range from the mildly sane to the wildly insane. Everything from books of almost every shape and size to horses, poetry, musicals, BBC TV series, period drama, costume design, languages, music, science fiction TV series, history, world culture and opera, to name just a few. She also loves meeting new people, in real life or through the blogging world. Title quote is from Snicket's newest book, Who Could That Be At This Hour? I loved to read encyclopedias too. And I am a total sucker for anything Arthurian. Best of luck with it! Very interesting! I really like your idea - and how you pick and choose which legends you want to use. That's really admirable. I know I would be overwhelmed by all the different legends... But I also know that if someone is really driven about their passion, they can achieve anything! Thank you, Abbey! You're very encouraging! Sounds like a really interesting topic for a book. Best of luck with it, Melody!! I honestly can't imagine reading an encyclopedia, but good for you Melody!! And your book sounds really exciting. I once read an Authurian mash-up about the "after" (called *The Stolen Lake* by Joan Aiken), which was fun and clever, but I'm pretty sure not exactly historically accurate. ;) But legends are lots of fun! Thank you, Cait! I hope it will prove to be exciting when it is done. I've not heard of that book, though I do know the name Joan Aiken from somewhere. I'll have to look it up sometime. I, too, wonder what happens at the end of books. I have even written the authors asking them to write more. :) I will definitely have to read your first book when it comes out! I love your book so much! When will it be available on Amazon? I haven't ever write an author asking them to write more. It is a good idea! I usually just fume and stew, "They didn't tie up all the loose ends!" Thank you again for letting me be a part of this, Jack!! How were yours and John's holidays? I want to read this. (Have I mentioned this to you before?) It sounds like genius material, and everything I hear more about it only makes me more convinced of this fact. I want to read this.